Natural beauty is something that I have been working on very recently. I have always been so passionate about what I am putting into my body, I never questioned what I was putting onto my body. Which sounds ridiculous saying out loud. I have to admit that now I am totally smitten and obsessed with this idea of creating my own beauty products and learning more about better products out there. 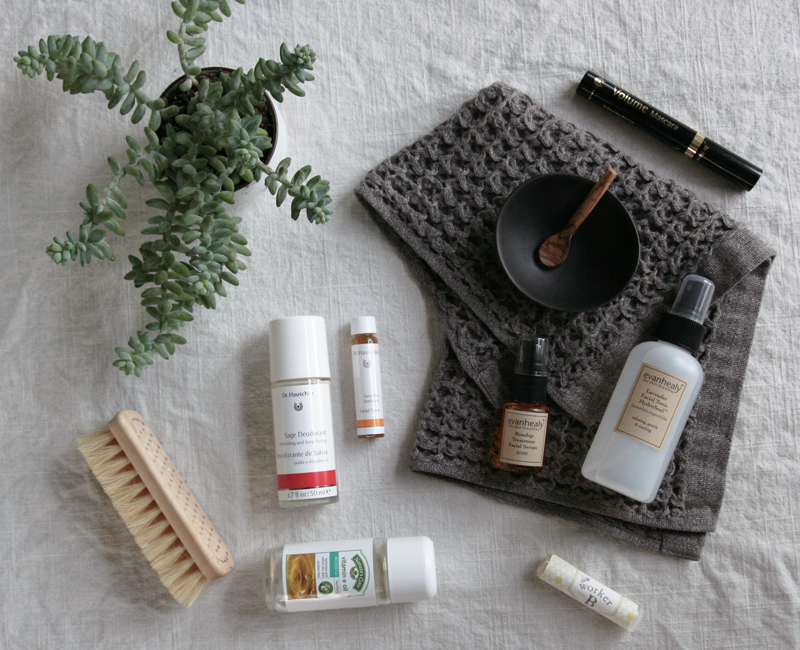 This section, ‘Natural Beauty’ of the blog will explore new ways to think about beauty and our daily beauty rituals. As well as, include recipes for luxurious beauty routines you can make at home and different product reviews on some of the best natural beauty products out there. Yoga has taught me something so amazing, you are worthy of love, beauty, affection and each and every one of us is perfect. Yoga helps uncover what is already there, our healthy bodies that are flexible, agile, strong and beautiful. Natural beauty routines and rituals are there to help uncover and remind you of your inner goddess inside of you, that already exists and is perfect. These are some of my favorite products that I use, that help me uncover my natural balance, glow, and true inner beauty. Dr. Hauschka Volume Mascara in Black // Good mascara is hard to find, and I am really loving my new Dr. Hauschka Volume Mascara in Black. Allow to dry after you apply, if I sneeze or accidentally whip my eyelashes I do get smudging, if you let if dry for about 2 minutes you will not get that. At first I had to get use to a softer mascara, this will run if you cry ladies… but know that, that is a good thing, you want your mascara to easily come off! Dry Brush from the Foundry Home Goods // A very good friend of mine turned me on to dry brushing about a year or so ago, and I just love it. Dry brushing your skin before you shower helps to increase circulation to the skin which reduces cellulite, helps shed dead skin cells which can help keep your skin clear and smooth our irritations like ingrown hairs, improves and encourages vascular blood circulation and lymphatic drainage. Dr. Hauschka Sage Deodorant // Being a yoga instructor, I am constantly sweaty and well, around people, needing to smell fresh. I do not typically wear deodorant, but when I do not need to it is nice to have an option that doesn’t include all of the ‘stuff’ you don’t want on your skin. Dr. Hauschka Facial Toner // I have a little travel size of Dr. Hauschka’s Facial Toner, and it is simply amazing. If I take an evening shower after a long day, before bed I will apply this toner on and let my face be open and bare. Evanhealy Rosehip Treatment Facial Serum – Rose // This amazing facial serum not only helps to bring your skin back at the proper alkaline, pH balance and supports vitality, hydration and aids in repairing damaged skin, it includes all of my favorite scents right now. Sweet, rosy-leaf geranium and earthy, vitalizing carrot seed combine to balance and regenerate diverse skin conditions. This is my absolute favorite beauty product right now. Nature’s Gate Vitamin E Oil //”Vitamin E oil works to block free radicals from the body, which play a large part in the aging process. If we can fight off free radicals, then we can reduce wrinkles and keep the skin youthful-looking.” -Huffington Post <– This is a great article about Vitamin E for your skin, hair and nails. It is important to select Vitamin E Tocopherol, it is the only form that is recognized to meet human requirements. Worker B Minneapolis, Lip Balm // This Lip Balm is made by Worker B which makes skincare products that are made in Minneapolis, Minnesota USA. Worker B creates their products from beeswax from their own hives and a variety of other local beekeepers. All of their beekeepers are chemical, pesticide and antibiotic free and that the hives are non-migratory. Everything is still made in small batches by hand which makes it so much different from other beeswax products out there. All of their products are water-free as well, with no fillers, which means you can use less product, it is highly concentrated with 100% beneficial ingredients. Check out their website for more details, I highly recommend this product! I just bought a dry bush at the Foundry! What’s up what’s up 🙂 And I love Worker B. 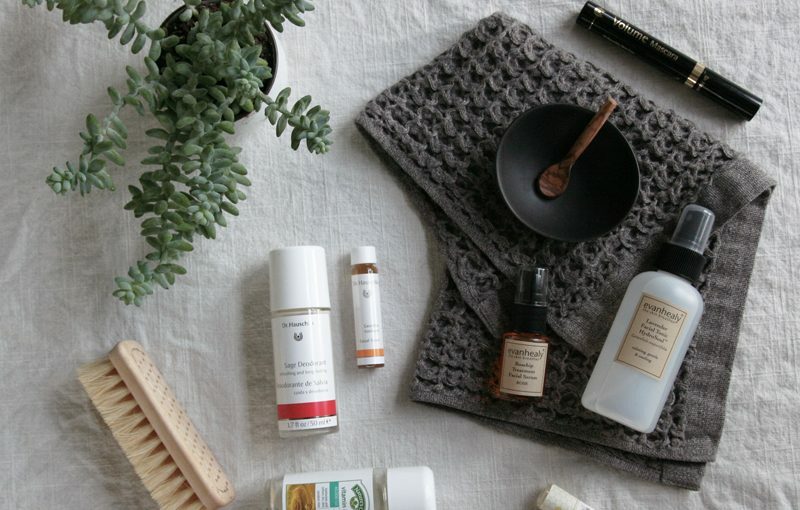 Where do you get Dr. Hauschka’s products in Minneapolis? Awesome Ellie! You are going to love it. You can find Dr. Hauschka’s products in Minneapolis at some Whole Foods locations and Co-op grocery stores! I buy my products at Seward Co-op! Awesome, I would love to meet them. This is an awesome list! I’ve been on the hunt for some natural mascara and deodorant! I’ve also been so intrigued by rose-hip oil but haven’t pulled the trigger yet. You have me convinced! So glad our paths crossed. Great info and great site, Ella!